Every time I load a Mixed Mode demo on any of my browsers, I see a surge in CPU usage. I wonder what it would be doing on the phone. Has anyone observed it on their end? 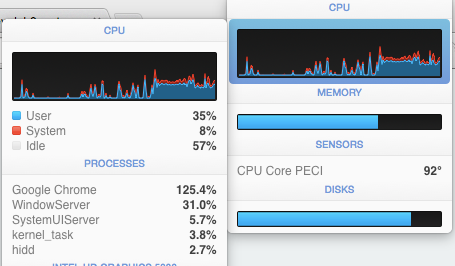 PS - The screenshot is from "iStat Menus". How intense is the demo? Can you give some sample links? As I understand it, as of mixed mode, if nothing is moving, CPU (for that app) should be near 0 - assuming the demo is well designed. For a clear reading, you should probably only have 1 window / 1 tab open, and then the CPU / GPU usage in the chrome task manager (shift-esc). This is on OSX, right? What version of Chrome? And you say this is on all your browsers, which others? Note that things like having a transparent window from some other program over your browser window can affect rendering. Re the link; yeah, these are all the kinds of principles famous adopts. There are a few crucial links in there to very NB info, but, a lot of that stuff famous handles for you so you don't have to. Not everything though and some useful stuff to keep in mind; a few things are mentioned at http://famous.org/learn/pitfalls.html. Got it. Can you try find some pure Famo.us demos (without Meteor) and see if you get the same resutls? And if you do report it upstream and link back here? (It's a bit hard for me to check since I have about 15 windows open with 15 tabs each But I haven't noticed anything specific on latest chrome stable/beta on Linux with NVidia drivers). Haha I was wondering if I went too far on that one but feedback has so far been positive Glad you enjoyed it and that the material has been helpful. As you can see the fview-lab isn't really finished yet, but I still have a lot planned for it with a stable release intended for later this year.